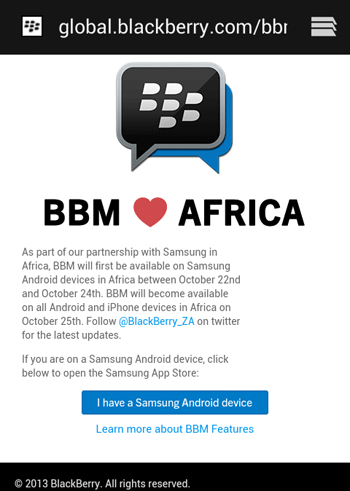 As part of the partnership with Samsung in Africa, BBM will first be available on Samsung Android devices in Africa between October 22nd and October 24th. 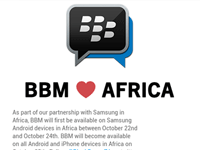 BBM will become available on all Android and iPhone devices in Africa on October 25th. Anyway, an easy workaround is to just get hold of the APK from a Samsung friend and just install it manually. We’ll see if we can post it somewhere later. But when you do this, you’ll need to get over another hurdle: If you had signed up on the waitlist on the BlackBerry site, you have nothing to worry about; you basically enter the email you used and starting BBMing away. If not, you will have to enter your email and start waiting your turn. There’s also another way if you don’t want to wait longer after installing the application. Cnet suggests you can go around it by opening the app, entering your e-mail address, clicking next, and then force-closing bbm. To do this on Android enter the multitasking menu and swipe the app away, or go to Settings, Apps, BBM, and click Force Close. There’s a third way: Just avoid BBM. Do you really need it right away? To do what? This is the million dollar question – why do you need bbm now anyway? Between whatsapp, viber, wechat and skype all my im needs are met! I dont know what the value proposition for bbm on android is.